In the United States alone, someone has a stroke every 45 seconds and someone dies of stroke every 3 minutes. As the number 3 cause of death among Americans (cancer and heart disease are the leading causes), stroke costs our healthcare system $57 billion each year (1). The cost of stroke between 2005 and 2050 in the United States is estimated to exceed $2 trillion (2). Supplements that have been found to help maintain a healthy heart include vitamin D (3) B-vitamins (4) like folic acid (5), and calcium (6). Now a new study (7) has found that tea, known to help with bone health in women (8), oral health (9), stress (10), colon health (11) and breast cell health (12), may also help with heart health. 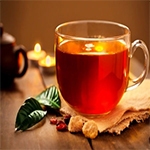 The Tea Council estimates that on any given day, about 50% of Americans drink tea, with the greatest concentration of drinkers in the South and Northeast. Tea sales in the U.S. doubled between 1990 ($1.8 billion) and 1994 ($3.75 billion) (13). In 2002, Americans drank 0.2 kg of tea per person per year, while those in the United Kingdom were #1 in tea consumption, drinking 2.3 kg of tea per person per year (14). In the study, researchers analyzed data from 9 studies involving almost 195,000 people who suffered 4,378 strokes. They found that those who consumed 3 or more cups of green or black tea per day had a 21% lower risk of stroke than those consuming 1 or fewer cups per day. The researchers cite that there may be no difference between green and black tea consumption in regards to heart health because both green and black tea have been shown to benefit blood vessel health (15). Although the types of catechins differ between green and black tea, their total amounts are comparable because both black and green tea are derived from the same source, which are the catechins produced within the Camelia sinensis plant (16). 2. Brown DL, Boden-Albala B, Langa KM, Lisabeth LD, Fair M, Smith MA, Sacco RL, Morgenstern LB. Projected costs of ischemic stroke in the United States. Neurology. 2006;67:1390 –1395. 12. 12. Shrubsole M. Drinking Green Tea Modestly Reduces Breast Cancer Risk J. Nutr. 2009 139: 310-316. 15. Jochmann N, Lorenz M, von Krosigk1 A, Martus P, Boehm V, Baumann G, Stangl K, Stangl V. The efficacy of black tea in ameliorating endothelial function is equivalent to that of green tea. Br J Nutr. 2008;99: 863–868. 16. Alca´zar A, Ballesteros O, Jurado JM, Pablos F, Martín MJ, Vilches JL, Navalo´n A. Differentiation of green, white, black, Oolong, and Pu-erh teas according to their free amino acids content. J Agric Food Chem. 2007;55:5960 –5965.